July 27, 2018 / Christy / Comments Off on Until Next Time! Goodbyes are always SO hard! They are even harder when you’re saying goodbye and have no idea when you will be visiting again! Bryan said we will try and come to Australia every 2 years. So far, our track record is every 4 years. I’m laughing because as I was finishing up the last of our Australia posts I received an email advertising flights from Texas to Australia for $700+! This is the lowest I’ve EVER seen! Maybe it will be in the cards for us to go sooner than 12 months. Only time will tell. The tickets haven’t been booked but I’m pretty determined! July 27, 2018 / Christy / Comments Off on Happy Birthday To Me! Saturday was my birthday so of course we started the morning off at the beach! Then we had a fantastic lunch with some friends and finished off the day with with pavlova and sparklers! The only thing that would have made the day bettie was if all my family and friends were there to enjoy the day with me! But . . . I have to admit that the days was as near perfect and I could expect! July 27, 2018 / Christy / Comments Off on Ferry To Sydney CBD! Our last Friday in Australia we decided to take a ferry to the CBD (downtown). NO mater how many times I’ve been to Sydney and been on the waterfront it NEVER gets old! It’s definitely in the top 3 of my most favorite cities in the world! While we were waiting for the ferry to arrive we played at the park. Unfortunately, the ticket machine at the dock wasn’t working and the fines are STEEP for riding without a ticket. Fortunately, one of the boat captains let us ride for free! Once we got to the CBD we had coffee and a little snack with a view. I could have sat there forever watched the boats go in and out. Of course we took some photos with the beautiful Sydney harbor bridge in the background! April 22, 2018 / Christy / Comments Off on A Visit With Old Friends! On Saturday David and Isobel came for lunch and a visit! We have known them for over 10 years! They first met our children when Ezekiel was 4 and Eden was 2! 4 years is too long to go without seeing friends so we’re committed to traveling to Australia every 2 years now. Doesn’t sound like too hard of a commitment to keep right? Anyways, We had the most fantastic lunch and the best time visiting! David is a genius and we spent quite a bit of time discussing elements, bonding and orbitals. David promised to Skype with Ezekiel when he has a question too tough for mommy . . . that may be next year with my super inquisitive son! Isobel is always such a JOY to be around! She borough the most amazing home made ice cream! It was such a treat! She thought about the kids as well and brought them both chocolate bunnies! Australia not only has the best coffee but their food is amazing too! I don’t know if it’s the biodynamic farming, the lack of chemicals they use in farming or what but the quality of the food there was far beyond what we have here. April 22, 2018 / Christy / Comments Off on Illawarra Treetop Adventures AKA hell for a person with Acrophobia! 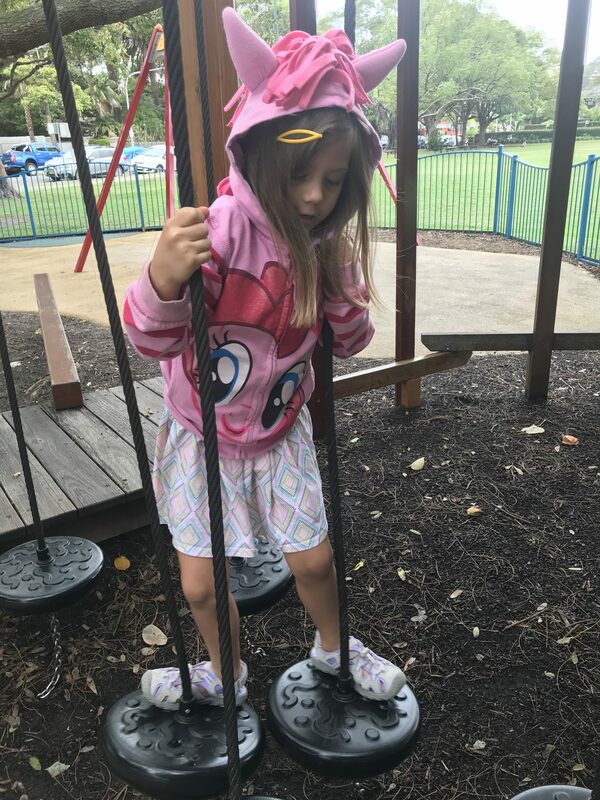 We drove over to Robertson and visited the Illawarra Treetop Adventures. They have a beautiful 1.5 kilometer walk to the 500m of steel bridges 20-30 meters above ground in the rainforest. We walked out onto 2 swaying springboard cantilevers suspended 25 metres above the forest floor. We also climbed a spiral tower that rises to a breathtaking 45 metres above the forest floor. The tower was pure torture! Going up wasn’t bad since I just looked into the tower wall. Once we got to the top there was no shielding my irrational fear of heights! However, the beauty we witnessed at the top was worth risking everyone’s life. I’m a very short person so I’m not used to being up high doing my normal day to day routine since I’m so close to the ground. I think I need to look into studies proving that short people are more afraid of heights than tall people. During that trip we also found out that Ezekiel also has a fear of heights. He stuck very close to an adult at all times and once he even told Zeph, “I’m not scared . . . I just want to hold your hand!” It was very sweet since the children adore him so much and they obviously feel protected by him too! April 22, 2018 / Christy / Comments Off on Beautiful Clovelly and Bluey! On Wednesday we went to Clovelly beach to snorkel! Bryan and I took turns snorkeling while the children played on the beach! Clovelly has a few resident Blue Gropers that we enjoy visiting every time we are in Sydney. These fish definitely have personality! One of my most favorite things to do it just swim and observe the fish and I LOVE Clovelly because the fish swim right next to you as if you’re part of their school! Doesn’t get much better than that! A Zoo With A View! April 22, 2018 / Christy / Comments Off on A Zoo With A View! Before we visited the Taronga Zoo we went and had coffee at the beach. The Australians know how to make coffee!!! Every single coffee I had in Australia was AMAZING! I don’t know how they do it. It’s painful trying to find even a decent coffee in the states outside of our house. So, that was a VERY nice treat so have so much great coffee while traveling! Back to our trip. The beach where we had coffee was gorgeous! We walked around a bit and took some pictures then headed to the zoo! The Taronga Zoo was AMAZING! The animals might have the MOST spectacular view in all of Sydney! Seriously! They are right on the Sydney harbor! Anyways, we had a fantastic day together and Eden even pet a snake! That verse sums up our life the last few years. We’ve been through a few seasons for sure. July 2016 we packed up everything, sold our house and moved to Texas. We did it all on a leap of faith, and it has been such a blessing. Bryan left Microsoft and started working as a Front End Developer at General Motors. GM moved the family down to Texas and it was the easiest but the most stressful move to date. Ezekiel and Eden adjusted quickly to the move and are loving the weather that allows them to play outside and swim every day in the warmer months. I love Texas! The weather here is amazing and I prefer when the temperature is over 90. Eden turned five this year and has grown into a compassionate and loving lady. We often find her putting others before herself. This year she asked for a specific toy for Christmas because she knew her brother would enjoy playing with it. Eden LOVES to workout! She has watched Bryan and I working out for so many years that she has decided to jump on board. She creates her own workouts and even has her own mini barbell to lift. Eden is also our social butterfly. She loves the new homeschool co-op we attend because she sees it as her chance to socialize and make new friends. Ezekiel is now seven and is a rough and rugged boy who loves to be silly. He accomplishes anything he puts his mind to and he is very competitive. We usually go for a scooter ride every morning to break up the school day a bit. I have an app that tracks our distance and our speed. Ezekiel is very interested in how much we improved our time each and every time we go out. I usually run while the children ride their scooters. When we round the corner and are in the home stretch Ezekiel rockets into the lead to make sure he always reaches the house first. Earlier this year, Bryan was recruited by indeed.com and now works as a senior design technologist there. He is enjoying his role at the company and has numerous perks that help him to enjoy his job. Indeed feeds their employees and their guests for free so, the children and I love meeting Bryan at work for lunch. Bryan ran three Spartan obstacle course races. His first race was a 13 mile race in Dallas with 37 obstacles along the way. Then he ran two races while we were in California. The first race was 9 miles and had 27 obstacles. His last race was the shortest at 4 miles with 22 obstacles. He earned the prestigious award of the Spartan trifectas by completing all three races in a calendar year. I am still a stay at home mom. I homeschool both children while working on my book business. This year I was promoted to Team Leader and I really enjoy the challenge. I am passionate about raising literacy awareness and helping American families bring quality literature into their homes. Ezekiel and I attend Bible Study Fellowship together every Tuesday night. This year we are studying the book of Romans and I love it because Ezekiel studies the same exact material I study but at his own level. As we go into this new year I’m working on looking forward instead of back. Bryan and I are sure that Texas is exactly where we are supposed to be. We might miss family and friends but we are looking forward to this new season of our lives! We are thankful for every opportunity that He has given us and all the blessings He has bestowed upon us. We know that God has big plans for the Anaya family and we are all super excited to be living for HIM! December 3, 2012 / Christy / Comments Off on Family Play Time! The time between dinner and bedtime is family play time! We always have so much fun together!